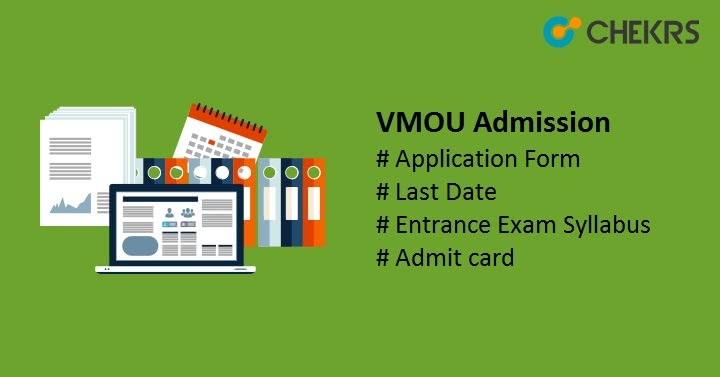 VMOU Admission 2019: Vardhman Mahaveer Open University conducts VMOU Admission procedure twice in a year i.e. in January and July Sessions. Candidates get admission to the MBA, only through the VMOU entrance exam. 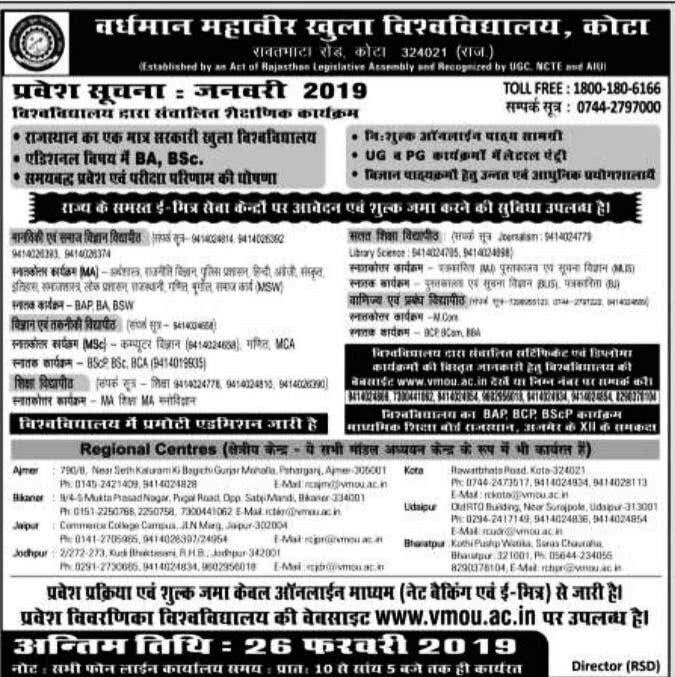 Latest Update: VMOU Admission Form Last date is 26th of Feb 2019. Latest Update: VMOU Application Form Filling procedure is already started. Check the procedure and fill the Application Form. Latest Update: VMOU Admission Notification Released!! Check the Notification Below. Admission will be provided into various colleges in the state Rajasthan. The university offeres various UG, PG, Diploma, Certificate and other programs in the field of management, computer applications, arts, science, etc. In This Article we are providing all the information regarding VMOU Admission and VMOU Admission Form. VMOU Admission official notification for January 2019 Admission session is expected to be available soon. Dates will be confirmed after it, But we are providing here the expected time duration of VMOU Events. The VMOU Eligibility Criteria will vary for different programs. However, the basic eligibility criteria for admissions in UG and PG can be found here. But still, don’t forget to verify the criteria using VMOU Notification. Indian, as well as foreign nationality, can apply for the VMOU 2019 exams. For UG courses: Passed class 12th or equivalent exam. For the PG degree course: Having a Bachelor’s degree in the relevant field. There is no age limit or Criteria and candidates. There is a relaxation of 5% for the candidates of Rajasthan belonging to SC/ ST/ OBC/ PWD/ Widow/ Divorcee female category. The Application form will be available in online and offline mode. Online Form will be available on the official website however the offline form will be available at the Regional Centers. In Offline Mode candidate have to submit the VMOU Admission Form at the same Regional Center/ office. Candidates can fill the application form from the month of January 2019 for July session and from the month of August/ September 2018 for January 2019 session. in online mode, candidates have to visit the official website and do the registration there. After registration Login on the site and access the Application Form After it, Fill all the asked details and upload required images. Take a print out of the filled application form and move to the fee payment. After making the payment Take a print out of the receipt and keep it safe. The Non-refundable VMOU Admission Application Fee can be submitted through E-Mitra/Online Banking/Challan only. The application fee will be Rs. 100/-, and For MBA fee will be 1000/-. The University Provide admission on the basis of Qualifying exam’s Merit list except for MBA and B.Ed, So there is no Exam pattern for others. Here we are providing Exam Pattern for MBA and B.Ed. Similar to the Exam Pattern, syllabus for MBA and B.Ed is given here. The Table also consists the number of questions from every subjects. I hope it will help you to start your preparation. The Hall Ticket will be Available online for the entrance exam on the official website. Candidates have to visit the official website and then log in there to download the VMOU Admit Card. Candidates also need to carry it to the examination center for verification along with one Photo Id. Admit Card o hall ticket will be also required throughout the Admission process. The VMOU Exam Authority will also release Answer key after the Examination. The answer key will be available Online only in pdf format on the official website. The candidate has to go to the official site and find the link for the answer key, Now after it click on Question Papers and their VMOU Admission 2019 Answer Key. Now You can observe your response and mistakes. VMOU Result will be declared on the official website. Candidates can access the result from the Result link from notice board. The Admission and Exam Authority will also prepare and release VMOU Admission Merit List for both modes of admission i.e. Admission Without Exam and Admission With Exam. Candidates who have qualified the VMOU Admission Entrance exam for MBA and B.Ed will get admission after Choice filling, Seat allotment, and Document verification. While on the other hand Candidates who applied for admission after qualifying other exams will be shortlisted on the basis of Scorecard and other Eligibility Criteria For GD/PI round For Admission in other similar courses. All the Selected candidates have to take part in this admission round like GD and PI ­­­­Process.